LDI presents the next opportunity for trade show visitors to experience the MADRIX product range of LED lighting control solutions. Two particular products will be presented to the North American audience for the first time: PLEXUS Remote and MADRIX 2.14a. 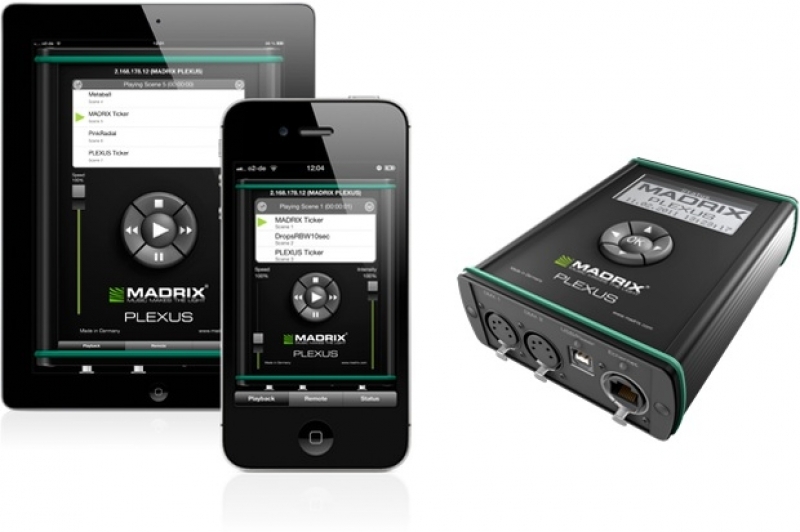 PLEXUS Remote is a smart App to gain full control over MADRIX PLEXUS, a DMX512 interface and Art-Net node with unparalleled live or stand-alone possibilities thanks to the MADRIX software bundled with it. MADRIX PLEXUS came out originally in August 2011. Several updates, incl. sunrise and sunset timers and direct remote control via DMX-IN or Art-Net, have since been released to further enhance the already numerous features of the versatile interface. PLEXUS Remote now takes accessibility to a whole new level. The App allows you to conveniently access the PLEXUS unit remotely, creating one of the smartest solutions to control LEDs. It was never easier to trigger scenes or to change the brightness or speed of your lighting. PLEXUS Remote is available for free on the App Store for iPad, iPhone, and iPod touch. It requires at least iOS 4.3 and is ready for Retina displays. Minimal effort is required to set up the configuration of the App. Years of development made MADRIX the advanced LED controller it is today. MADRIX 2.14a is another free update for the unique software suite. The new version contains many improvements for MADRIX and MADRIX PLEXUS alike. The highlights are CITP v1.1 and the MADRIX Time Code Sender. CITP v1.1 is implemented to support a wider array of consoles and other compatible equipment. MADRIX Time Code Sender is a very handy tool to generate Art-Net Time Code for the Cue List of MADRIX. Time Code on the other hand is a convenient way to synchronize independent equipment with each other. This could be external audio equipment, other MADRIX computers, or even the same computer. You can easily set up a time-controlled show in sync with timelines of sound and lighting effects of MADRIX.